Well actually it is more like chocolate fondant. 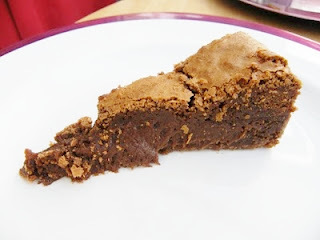 This is another brownie recipe from the little Good Food Magazine book - 101 Chocolate Treats. It didn't work out quite as planned. When I was whisking up the final mixture, I was eyeing the quantity in the bowl and looking at my brownie pan and thinking "no way, is that going to fit! ", so I decided to spilt the mixture between a 9 inch/23cm spring form cake tin and a 8 inch/20cm square brownie pan. I poured most of the mixture into the cake pan, I filled it ¾ of the the way up and poured the rest of the mixture into the brownie pan. The cake I baked for 45 minutes until papery on top and wobbly, this produced the gooey texture of a dessert. I put the brownie in for 20-25 minutes and used a skewer to see if it was ready. When the skewer came out quite clean I took it out and this resulted in a lovely chewy brownie. Two for the price of one. I will give you the original recipe, with cup measures added and you can decide which way you would like to try it. Preheat oven to 180c/Gas 4/fan oven 160c. Butter and line a 30 x 21cm/12 x 8¼ inch cake tin. Melt the chocolate with the butter in a bowl over a pan of hot water. The original recipe called for a topping of melted chocolate followed by a dusting of icing sugar, but I didn't bother. To be honest, I forgot. I had visitors while I was making the brownies. Easily distracted, that's me! 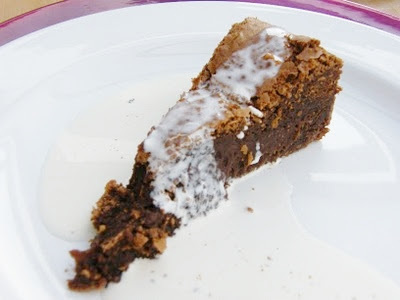 We had a piece of the brownie the first night and then a slice of the cake today with cream. I think it would be lovely warm with ice cream too. Can't beat a cake and brownie from the same batter. Nice looking desserts. Hi TB, I wish I had taken a photo of the brownies before I sent Graham's brother off home with them. They were a perfect consistency. I think these would be lovely no matter how they were served Jacqueline. Sometimes you only need one word: yum! Brownies in a cake? Ooh scrumptious! Nomnom warm chocolate brownie and good quality vanilla Ice cream is the BEST! Looks amazing! This reminds me of a cake I made once called "Bete Noir"--so much chocolate! Oh! Chocolate fudge brownies...look so creamy and rich...yummie! Thanks Juliana, they are lovely and even more fudgey after a stint in the fridge, Mmmmmmm! Amazing chocolate brownies! Gooey, rich and decadent! Love that you made a cake with some of the batter. Either way, I want some! To be honest that is why I didn't add any too Johanna, although it really didn't need it. Oh scrummy, the picture looks just the way I like my brownies to be. Strangely I came across the Good Food 101 series in a shop today and of course had to look at the chocolate one. Managed to restrain myself from buying it - maybe that was a mistake! I'm a sucker for a good brownie. OOOOh,...Aaaaah,...I do think that these brownies look to die for,...ooh yes! Hey Choclette, they have the book for sale, extremely cheap, on Amazon. Me too Food Hunter, me too!